Christmas is in four days! Ahhhh! That is insane. I am still getting into my final stages of hype. Wrapping presents, baking cookies listening to music (Watch me do that in July, though) I’m really excited! So, I thought that I would review a holiday book to kind of go with the theme of holiday. When I was younger, I used to read Gingerbread Baby every Winter. Now, I’m going to come back to it, with new eyes. The cool thing is about this book is that few days after Thanksgiving, I actually got to meet the author, Jan Brett. She signed the book, so now I have an autographed copy of my own. I’ve never reviewed a picture book before, so this review will be a little different. Well, let’s get started! The book has the same structure as your typical Gingerbread Man book. A cookie is baked, turns out to be alive, and stirs up trouble. 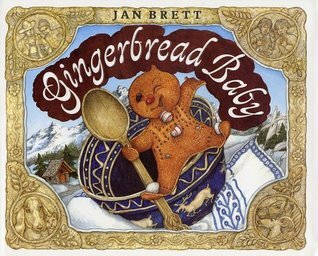 In the book, Matti decides to bake a gingerbread boy. He makes it all nice, and sticks it in the oven. But, instead of waiting eight minutes to open up the oven door, he opens it early. Boom! Out pops Gingerbread Baby! He runs through the town, running from all who try to catch him. From milk men to goats, he runs past everyone. What can finally catch him? Read to find out! I thought that this book was a very good adaptation of the Gingerbread Man tale. Both gingerbread were cocky and fast runners. However, this one is much more lovable. Perhaps it’s the decor on his body. The book is written so that is enjoyable for all ages. It is not your typical “He has a hat” type children’s book. There is enough challenging words for the child to have some difficulty reading, but not difficult enough for them to not understand with a little bit of explanation. The book is a fantastic read aloud, because all of the characters prompt the reader to possible act out the story, with many voices. The illustrations are extremely detailed and each one took easily three hours. The border around the illustrations are cookie themed, which is a nice touch. Also, Brett gives clues to what’s happening in another part of the story through small illustrations on the side of the page. Children will be able to stare mesmerized at this book. My favorite part was the end, which does differ from death by fox. I’m a huge fan of great endings, and I found this one to be nice. I do wish it had one more page at the end, as it does give a small wanting for more. Next It’s Beginning To Look A Lot Like Christmas!